Piano students and their parents may not be aware of some very common technical mistakes that can hinder their playing and development. Below are five problem techniques to look out for and remedy in order to optimize you and your child’s comfort in learning to play the piano. Your wrists may be the most crucial component of your piano playing mechanism. The muscles and tendons in your hand and forearm can easily be put under undue stress if the wrists are not used correctly. When you or your child is practicing, keep an eye out for wrists that are regularly too high or too low. There may be moments when the wrist makes these shapes while playing piano, but they should never be held for any extended period (longer than a second or two). Your wrists should be even with your forearm while playing the piano. This maximizes efficiency of movement and evenly distributes the workload to the appropriate muscles. In young children, this problem can most often be solved by providing a stool or bench for them to place their feet. When a child’s feet cannot yet reach the ground, it is hard for them to play the piano with any reasonable strength. This is mostly because they have no foundation on which to support themselves. They cannot play the piano without “hanging off a cliff.” This is something adults take for granted (imagine sitting on a high barstool; very uncomfortable and easy to lose balance). Try putting a 6” - 12” high stool underneath a young child’s feet and see how their performing improves! This may be the most common problem among pianists of all ages. 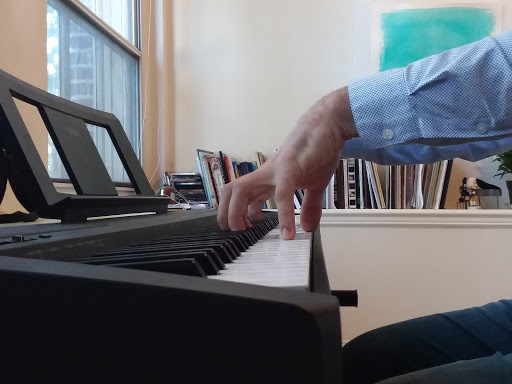 The shoulders are a common place to hold tension, in piano playing and in everyday life. There is absolutely no reason to ever shrug your shoulders while playing piano. There is no benefit in doing it and is counterproductive. The shoulders should always be dropped and relaxed. The solution I offer to this problem is simply regular supervision. Everyone who holds tension somewhere in their body knows the first step to fixing it is awareness. After that, it is simply acknowledging it, and then trying to do less of it going forward. It is very hard when the actions are unconscious, but it can be fixed! Playing piano is a very complex science. Many components are occurring simultaneously, and it takes a lot of practice before the necessary motions become unconscious ones. Children are still learning to have total control over their fine motor skills, so it is common for them to tense all of their fingers, even when they all are not being used. Try supervising your child while they practice to ensure that the only active fingers are the ones being used at that time. Wrist rotation will also help reinforce relaxation. Another problem that adults face as well as children! When seated upright and hands on the keyboard, the ideal seat height is one which allows your elbows to be in line with the keys. If the bench is substantially higher, the shoulders and upper arm become stressed. If the bench is substantially lower, the stress is placed on the wrist and forearm. An adjustable bench is the easiest solution to this problem, but placing cushions or even books for a child to sit on can also work! This issue is similar to the one of bench height. It is common for a student to immediately put their bench very close to the piano and play using solely their fingers. This limits motion in the arms and does not allow for any arm weight while playing. The ideal distance from the piano should allow the student to fully extend his or her arms and reach the back of the keys (or touch the fallboard in the case of an acoustic piano). This allows for full range of motion in the hands, wrists, and forearms. Be on the lookout these very common piano playing mistakes. Giving a student a strong foundation in technique allows them to play to the best of their ability now as well as the opportunity to reach their full potential in the future!